Natural beauty at it’s finest. Located between Fish Creek and Ephraim, this state park is a 3,776-acre treasure on Wisconsin’s Door County peninsula. Rocky bluffs ascend over 150 feet while deer graze contentedly in abandoned farm fields. Considered Wisconsin’s most complete state park, Peninsula offers an 18 hole golf course, sand beach, bike trails, a lighthouse, cross-country skiing in winter and eight miles of spectacular Door County shoreline. Located northeast of Ellison Bay, is a 2,400-acre “wilderness park” with 11 miles of Lake Michigan shoreline and 3 miles of sand beaches. Newport offers 38.3 miles of trails; all of them open for hiking. Of these, 16.8 miles also are open to off-road bicycles. In the winter, 26.3 miles of trails are available for cross-country skiing, including 12.5 miles groomed and tracked for classical skiing, 2 miles groomed for skate skiing, and 4.5 miles are open for snowshoeing. This park, established in 1967 to protect the fragile dune environment, is an 865-acre day-use park located south of Jacksonport. Stroll along Lake Michigan, watch waterfowl at Clark Lake, use the boardwalk to discover the wetlands or relax on one of the many trails throughout the forested sand dunes and beech forest. Located at the very tip of the Door County Peninsula, is a 700-acre gem. The Pottawatomie Lighthouse, a sand beach, and an Icelandic-style boat house offer a diverse experience. Cars and even bikes are not allowed on the 912-acre island, making for an experience unlike any other Wisconsin state park. 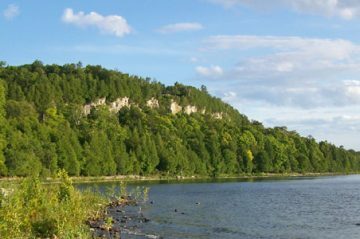 This state park, on the shore of Sturgeon Bay in southern Door County has 1,200 acres of gently rolling upland terrain bordered by steep slopes and rugged limestone cliffs. Over two miles of shoreline provide many scenic views and recreational opportunities. A 75-foot observation tower rises above the forest canopy giving a panoramic view.